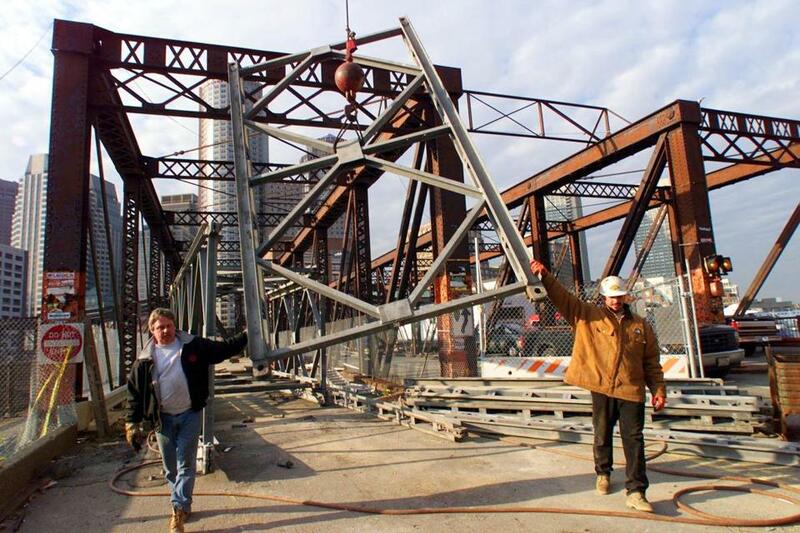 Workers removed a section of a steel pedestrian walkway that spanned the old Northern Avenue Bridge, after the Coast Guard ordered the pedestrian walkway removed. The City of Boston is planning to take down the deteriorating Northern Avenue Bridge starting in March, officials said Thursday, a decision made more urgent after the Coast Guard warned it could collapse into Fort Point Channel. The Coast Guard wrote to the city in October, requesting that it make immediate repairs or demolish portions of the century-old bridge because of safety concerns. Since then, the Walsh administration has been working with the Army Corps of Engineers on options for the bridge, which is beloved by preservationists. The city, which would need a permit from the corps to remove or repair the structure, revealed this week that it plans to spend up to $100 million for a new span. The city has not decided how it will rebuild the bridge, at a cost ranging from $30 million to more than $70 million. Just taking down the entire bridge would cost an estimated $15 million. 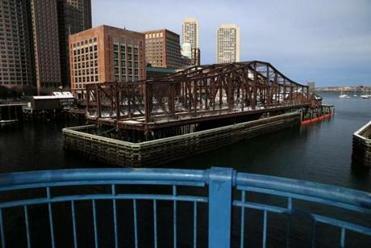 Can the Northern Avenue Bridge be saved? Here are some concepts and cost estimates the city has been reviewing to rebuild the Northern Avenue bridge. “The process is being developed with an understanding of the historic nature of this bridge, so as to maximize future preservation options, while dealing with the current public safety challenge,” according to a statement from Bonnie McGilpin, a spokeswoman for Mayor Martin J. Walsh. The steel swing bridge has been in disrepair for decades. The city closed it to vehicles in 1997, and to pedestrians in December 2014, when city engineers determined that the bridge could not support any weight. Walsh has committed to replacing the bridge as part of the city and state’s agreement to persuade General Electric Co. to relocate its world headquarters to Boston. The industrial conglomerate wants to be in the Seaport District, and the city offered to rebuild the bridge, which connects the Seaport to the Financial District, as a benefit for the entire South Boston Waterfront. Reopening the bridge could help ease traffic congestion in the booming neighborhood. But given the Coast Guard’s warnings in its October letter, it appears the city had to take action soon, whether or not GE uprooted itself from Fairfield, Conn. City officials have said that they have been reviewing their options since closing the bridge over a year ago. Taking down the structure would be the second prominent bridge removal by the Walsh administration. Last year, the city ordered the demolition of the Long Island Bridge in Boston Harbor for safety reasons. The cost was about $20 million. This spring, the city plans to develop a public process to determine the future of the Northern Avenue Bridge. The fiercest debate is likely to center around whether to build a newly designed bridge or to build a rehabilitated version of the historic bridge. It’s widely considered that rehabilitating the bridge would cost more money. The Walsh administration has been careful not to favor one position or the other, but the mayor has said that he wants to rebuild the bridge to support pedestrians, bicyclists, and cars. “Over the past year, the mayor has listened to several stakeholders, preservation advocates, and public safety officials and all options are still on the table for rebuilding the bridge,” McGilpin said. The bridge is listed on the National Register of Historic Places, but it is not designated as a Boston landmark, which would offer it more protections. Greg Galer, executive director of the Boston Preservation Alliance, expressed concern that the city plans to take down the entire bridge, instead of just the parts that are most prone to falling into the water. “It’s a big overreach,’’ Galer said. The Coast Guard has written to the city at least four times since 1997 to request engineering reports or action to address the bridge’s structure. In its Oct. 26 letter, the federal agency called the bridge a“hazard to navigation” and requested that the city promptly remove a major portion of the bridge that’s known as the center swing span superstructure. “Though the City has considered options to resolve the matter, they have not yet provided an acceptable plan of action,” the Coast Guard wrote. In an interview Thursday, a Coast Guard official reiterated the agency’s concerns about the structural stability of the bridge. Last winter, the city had to lock the bridge in the closed position to brace the swing deck under the weight of the historic snowfall. Based on those reports, the Coast Guard has wanted the city to take action as soon as possible. “It would be best the structure be removed before the next major snowstorm,” said Chris Bisignano, the Coast Guard’s First District Bridge Program manager. Bisignano said that if the bridge were to fall, it would pose hazards not only to boats but to pedestrians on land. The Moakley United States Courthouse sits in front of the bridge, as does the Barking Crab restaurant, the Envoy Hotel, and a section of the HarborWalk, a public walkway that rings the waterfront. Bisignano said that kind of structure hitting the water could create a dangerous situation. He likened it to standing on the beach and being hit by a wave. “It knocks you over,” he said.